The Short Version: Before texting, websites, and chat rooms revolutionized the dating scene, singles would place personal ads in the newspaper to meet one another. Newspaper adverts, particularly in the UK, facilitated a dialogue among well-educated, middle-class daters who subscribed to the same papers. Today, Encounters Dating networks the UK’s newspaper readership for online dating purposes. The dating site launched in 2005 in partnership with The Times and now attracts thousands of singles in urban and suburban areas across the country. The secure dating site and app inspires confidence in members, with intuitive matching, easy search features, and a private messaging system to facilitate engagement. By cultivating a quality membership, Encounters Dating offers a premium online dating experience for adult singles in search of something serious. A single mother in the UK had been on Encounters Dating for a few months when a particular profile caught her eye. She didn’t have time to waste in chitchatting endlessly online, so she sent a message to tell him she was looking for something real and invited him to answer back if he liked her profile and wanted the same things she did. He got in touch right away. They played it cool at first, keeping their Encounters profiles active while sussing each other out, and as months passed, their feelings grew stronger. At last, because both would be alone on Christmas Eve, they made plans to spend the holidays together. He brought over “Breakfast at Tiffany’s,” and as they watched it, they realized the movie perfectly summed up their relationship. Encounters Dating provides serious-minded daters a unique dating culture centered around newspaper readership. 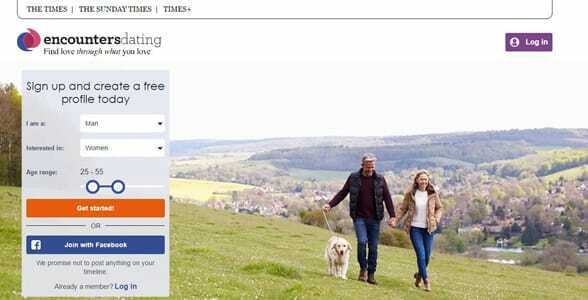 The Dating Lab, a leading provider of online dating services, dreamed up the site (and app) in 2005 as a way to connect subscribers of the UK’s largest daily newspaper, The Times. Now cultured singles in London and the surrounding Home Counties use the platform to create detailed dating personals and meet people online. The dating website’s motto emphasizes the importance of common interests in dating. Because of its roots in a notable and longstanding newspaper, Encounters Dating attracts a more mature and educated base of singles. If you’re someone who likes to stay informed, discuss the news, and bond in meaningful ways, Encounters Dating can connect you to thousands of similar daters worldwide. Before the rise of the internet, many adult singles took out personals in the newspaper as a way of signaling their availability and seeking deep relationships. The UK’s newspaper circulation was an effective networking tool for middle-class readers. The medium ensured a quality selection of date prospects and gave singles a sense of security. 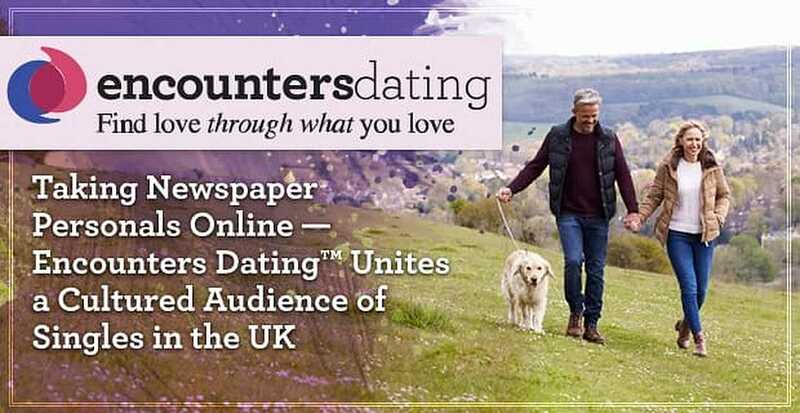 Encounters Dating brings the authority of well-known newspaper brands, including The Times and The Sunday Times, to the dating industry. Built on the foundations of a well-established media company, the platform provides a trustworthy space for singles who want to meet a person of substance. Avid newspaper readers can connect with one another online using Encounters Dating. Encounters Dating is a proud member of the Online Dating Association, which means it has promised to adhere to strict ethical guidelines to keep online daters safe on the web. A dedicated customer service team checks each photo and profile to protect everyone on the dating site from unsavory characters. Members can block anyone bothering them online, and the team does everything possible to remove any false or malicious profiles. As a safe and accessible dating platform, Encounters Dating caters to adults interested in finding a long-term relationship. The average age on the dating site is 51, so commitment-oriented individuals enjoy a mature and receptive audience. The website’s layout is simple and user-friendly. You can search by age range or location to find a date prospect and initiate contact by sending a private message or adding the profile to your favorites list. The profiles have tick-box sections outlining appearance, hobbies, interests, and general characteristics, so you’ll see your commonalities at a glance. Members can connect with up to a thousand matches using the site’s intelligent two-way matching feature. Encounters Dating serves a slightly older demographic, including many widowers and divorcees. 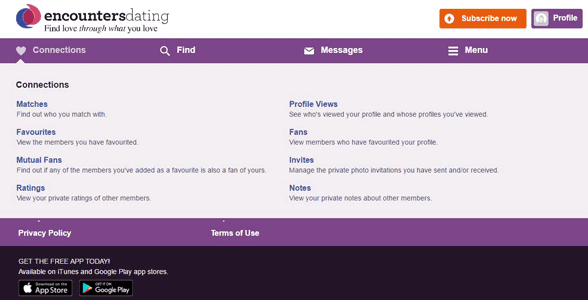 Free members can create a profile on Encounters Dating, add up to 10 photos, and read messages in their inboxes. No subscription is required to browse the site, but a one-month subscription (starting at £32) gives you more communication options. Paid subscribers can send and read unlimited messages as well as view invitation-only photos, sort search results, and search messages by keywords. Plus, for a premium fee, you can widen your dating pool even further by allowing free members to send you messages. In the straightforward layout of the platform, it’s easy to find people to engage in a flirtatious conversation. You can see who’s viewed your profile, who’s currently online, which members are celebrating a birthday, popular male and female members, as well as new members. Hundreds of members join each week, and a majority have been referred to the site by someone who had a pleasant experience on Encounters Dating. Members feel confident using a dating brand backed by trusted newspapers in the United Kingdom, and the high referral rate speaks to that level of trust. Encounters Dating gives singles access to a network of serious-minded date prospects. Since 2005, this dating site’s powerful algorithms have proved adept at pairing up compatible members in long-term relationships. If you’re looking for a reliable dating platform in the UK, you can join thousands of free and paid subscribers on Encounters Dating. Creating a profile is free so you can explore the site at no cost. The dating platform’s straightforward search and matching features allow you to find date prospects quickly and safely. In a few clicks, you might just meet your own Holly Golightly or Paul Varjak to spend the holidays with.